Hyde Park, NY – Eighteen years after it opened, The Culinary Institute of America’s award-winning Apple Pie Bakery Café today re-opened its doors with a beautifully redesigned space, and a menu featuring both classic Apple Pie Bakery Café favorites and crave-worthy new sweet and savory selections. The CIA turned to trusted collaborator, hospitality designer Adam D. Tihany to reimagine the Apple Pie Bakery Café for the next generation of students and the local community. 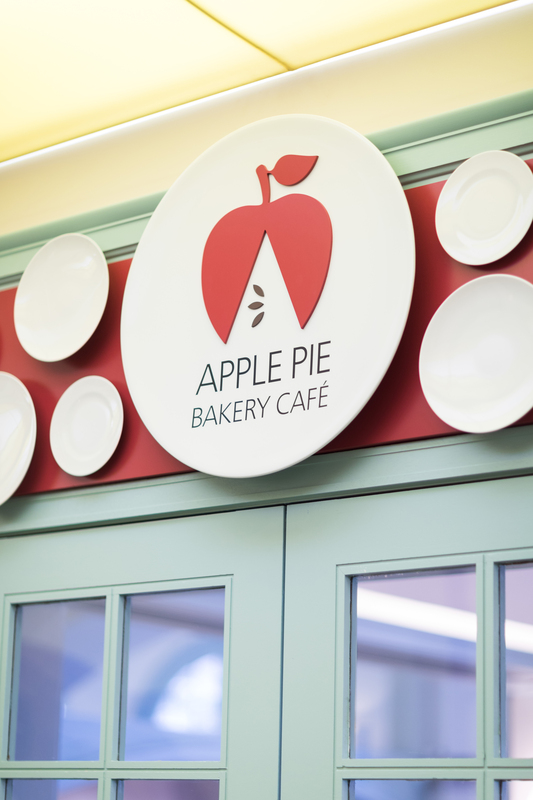 Since its opening, Apple Pie Bakery Café has been one of the CIA’s most popular restaurants, prized by local residents and visitors alike for its fantastic food, breads, pastries, cakes, pies and casual atmosphere. By 2017, the café was serving two to three times the number of guests initially anticipated. As part of the renovations, the café’s kitchen and service lines were expanded to better accommodate our guests. From a design standpoint, the dark wood and wall coverings have been replaced by cream and shades of soft, cool green, creating a bright, open space. In addition, the brick wall facing the courtyard has been painted white to complement the natural light coming through large arched windows. Classic brasserie-style decorative floor tiles set the tone for a relaxed, welcoming environment, while modular chandeliers and circular sconces illuminate the space throughout. The new layout includes a separate dining area with table service, along with an expanded and easier-to-navigate separate take-out and grab & go section. The staff at the Apple Pie Bakery Café—both front- and back-of-house—are CIA students, in the final weeks of their associate degree studies in baking and pastry arts. The new café provides them a hands-on opportunity to achieve the highest levels of excellence in cooking, baking, and service. The Apple Pie Bakery Café Take Out Area is open 7:30 a.m.–6 p.m., Monday–Friday, with seating available from 7:30–10 a.m. Table Service is offered Monday–Friday, from 11 a.m.–5 p.m. For more information and to view the menu, visit www.applepiebakerycafe.com.